We got up early and after a quick breakfast, we headed towards Trimbakeswar Jyotirling. Hotel is decent but the breakfast spread did not have much variety. But the food was good enough. It seems the hotel is patronised by many people from the business establishments near by and is very popular among business crowd. Here is my review of the hotel in Tripadvisor. We left the hotel at 9AM. Hotel Ibis is on the road towards the temple and it took us around half an hour to reach the temple. We were in temple parking at 9:26am. Of all the Jyotirlings we visited, Trimbakeswar Jyotirling seems to be one of the most popular ones. 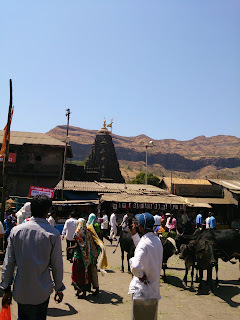 When we reached there, we found atleast six large buses full of tourists (pilgrims) from Gujarat. We had to stand in a queue in sun for almost one hour. One could regularly see VIPs directly going to the temple, while the commoners had to stand in queue for a glimpse of the god. It seems like VIPs don't even have time for god, it is the god who has to accomodate them rather than other way around. Another lesson that I learnt the hard way, again, was that most of these places, the best approach is to delay buying the prashad as late as possible, so that you can leave your footwear there. The official footwear stands are generally too far and walking barefoot on hot road or granite is very painful, specially for children. Anyway, we were finished with the darshan and out in parking by 11:20am. Our destination for the day was Ahmedabad, we started towards Ahmedabad. One has to be careful though, the route shown by Google Navigation from Trimbakeswar Temple to Ahmedabad finds a shortest route that is not good, it is better to go towards Nashik town and once closer to Nashik town, then plan a route to Ahmedabad. The basic strategy that we followed in finding this route was to reach NH-8 as soon as possible. Google Navigation designed a path for us that went through SH22 and joined NH-8 near a town called Killa Pardi. Here is the route that we finally took to our hotel in Ahmedabad. 12:15pm We reached SH-22. The road is extremely bad in places and better in some other places. The Maharashtra side of the road is really bad and its gets significantly better once you enter Gujarat. On Gujarat side also the road is narrow, but surface quality if very good and not much traffic so driving improves after that point. On Gujarat Side it becomes SH 186. 1:35pm We continue on MSH-22/GSH-186 combination and cross the Maharashtra border into Gujarat. The only problem is that this whole combination of road MSH-22 & GSH-186 is completely isolated, you don't find any cities on the way, even finding petrol is hard. There are small settlements and few houses. It is a rocky and hilly terrain with most of the traffic composed of trucks. 2:35pm We hit the national highway (NH-8), drive becomes significantly better from here onwards. Most of the roads become 4-lanes with some even 6-lanes from here onwards. 3:30pm Fuel time, we decide to stop at a Petrol Bunk with huge signage of Sugar 'n Spice. I must say that the restaurant was horrible, the toilets were really dirty and ladies toilet was not even functional. I have never understood the whole point of a highway restaurant that can't even have clean toilets. Food anyway is just about ordinary. We get out of that place quickly. Another interesting feature of Gujarat is that even on national highways people blatantly, with full confidence, drive on the wrong side of the road in both left and right most lanes. Not that it is only happening in Gujarat, but here it happens more often than what I have seen in other places. The good thing in Gujarat highways is that people with move away from right most lane if you are coming fast behind then, the bad part is that they will move too late and you have to slow down anyway. 6:53pm We enter the NE-1. For a car driver, Ahmedabad city is extremely painful. Most of the road is dedicated to the the city bus system and more than half of the road is cordoned off for the buses. One would not feel bad about it if there were actually buses plying on them. During my drive in the city I could spot not more than couple of buses. 8:30pm Finally we end up in our hotel on Ashram Road.